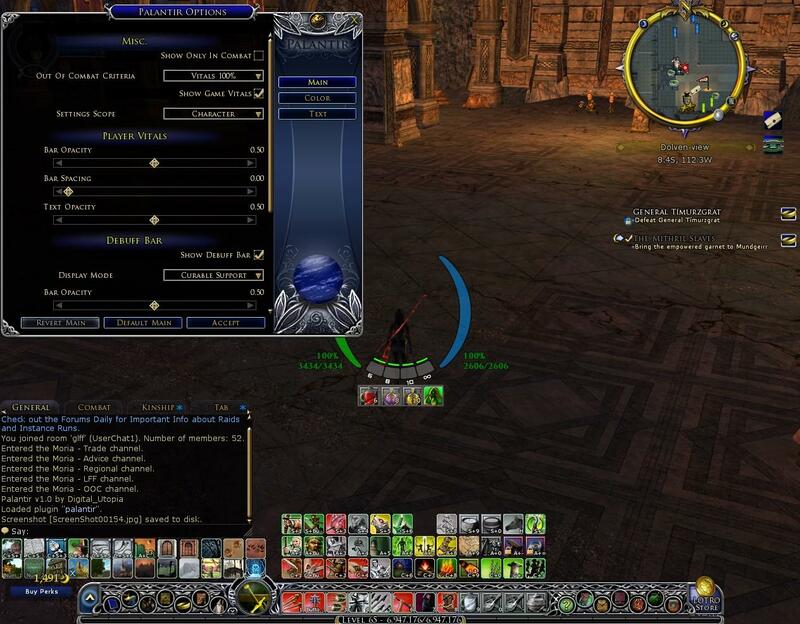 Palantir is a highly customizable Heads-Up Display(HUD) for LotRO that displays critical combat-related information at center-screen in an unobtrusive way. This allows the player to get the information they need without having to take their eyes off of the business at hand, as they would if they were to depend on the default UI elements. While Palantir is currently limited in what it can display, its limitations stem exclusively from the same limits LotRO’s Lua API does. As the API grows, so too will the amount of information that Palantir can and will display. morale bar supports "bubble" and dread -new! The option to display Palantir always, or only in combat. Due to the same issue, it will only display the quantity of the stack that is added. For instance, if you split a stack of potions, and add one of those stacks to a Debuff Bar quickslot, the count will only show the amount of that stack. Due to the inability to get the cooldown of an item through the API, Palantir assumes that all curables that are not skills are pots – triggering the cooldown meter for all items– when an item is clicked. Due to the above issue, cooldowns are triggered based off of the amount potions in a stack changing. Splitting up a stack that exists on a quickslot will result in the cooldown timer firing. Due to a bug in the API involving quickslots, you may find that the skill in the “1” Position on your main bar is overwriten. This seems to appear when a Plugin quickslot is “emptied” (i.e. you use the last one), but is not exclusive to this situation. Simply copy the DigitalUtopia folder (ignore the lotroplugin.xml file) from the zip file to your "My Documents/The Lord of the Rings Online/Plugins" folder. 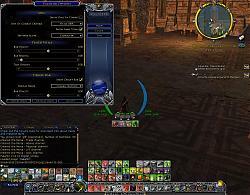 new Palantir now should be compatible with Bredic's LotRO Mod Manager. There will be a momentary pause as it loads, followed by the intro animation where you will see the bars fade in and the indicators on the debuff bar “blink” while your morale and power bars “fill up”. The options panel will open up, forcing Palantir to show itself (i.e. if it’s set to show only in combat), and showing 4 quickslots under the debuff bar. You can then easily add pots/skills (don’t forget to set cooldowns!) and change settings until you get something you like. For more information on options/settings, please read the below “Options” section. Suggestions? Problems? Questions? Found a Bug? I will do my best to respond, and if applicable address the issue as soon as possible. In the chat box once Palantir is loaded. This section contains options that deal with the operation and display of Palantir itself, as opposed to the elements within. Out of Combat Criteria - This drop down box gives four options as to when Palantir will hide itself when the player is out of combat(if Show Only In Combat is checked). Vitals 100%, Morale 100%, Power 100% and Out-of Combat. When the player is out of combat, Palantir will stay visible until the selected option is true. Show Game Vitals – When this checkbox is checked, the default player vitals UI element will continue to be shown, otherwise this will be hidden. NOTE: Palantir is unable to recreate the options in the context menu that appears when you right click on the default vitals. Hiding this element will prevent you from accessing this menu! Settings Scope – This drop down box allows you to select which way your settings will be saved and loaded (Account,Character,Server). Account will save your settings for any character you play, Character will save it for only your current character, and Server will save your settings so they’re only available when playing on the current server. If using the Curable display on the Debuff bar, and thus have quickslots to save, these will always be saved for the individual character. This section contains options that deal with the vertical bars that display player morale and power. Bar Opacity – This slider will affect the transparency of the bars. Bar Spacing – This slider changes the amount of space between the player morale and power bars. Moving the slider all the way to the right will result in a total size of around 1,200 pixels from the outside of one bar to the other. Show Debuff Bar – When checked, the Debuff Bar will be displayed – otherwise only the Vitals bars will be shown. Display Mode – This drop down box will allow the player to choose between showing just the debuff indicators (the 4 colored sections that appear when you get the appropriate debuff) or showing the information and allowing support for slotting potions/skills behind those bars (i.e. “click to cure” functionality. Debuff Indicator Opacity – This slider affects the transparency of the individual “lights” that appear when you have a curable debuff. Vertical Position – This slider allows the player to move the position of the Debuff Bar down from its default position. These are where you type in your cooldowns for use with the Curable option on the Debuff bar. Please note that due to poor event handling support, there's no validation on these text boxes. Typing anything in these boxes other than numbers (even decimals/colons etc) will lead to unexpected and probably undesired results. This panel contains options involving the color, and color effects of the vertical bars. Enable Color Effects - When this checkbox is checked, it will allow you to specify 1 or 2 bar level-based color points on the morale bar. If unchecked, it will simply stay the chosen color regardless of bar level. Enable Color Transitions - When this checkbox is checked, it will blend from the base color to the first point (then blend to the second) and back as the bar level does the same. Leaving it unchecked will cause the bar to stay at the chosen color until it reaches the specified point, then change to that color. Point #1 Location - This slider allows you to chose the point at which the bar will reach the above color. Works the same way as Point #1, just for an additional point. This section contains exactly the same controls as the previous one. Just replace "morale bar" with "power bar"
Group Text Position –If checked, this checkbox will group the settings together for the position of the morale/power text. Vitals Text Display - This drop down box allows you to set how you want the Morale/Power numbers shown. Options include: Percentage, Real Numbers, Current/Max and Percent w/ Current/Max. I'd like to send out a big Thank You to Vevenalia and Onori for their work on translating Palantir's options panel, and to Vevenalia for testing out Palantir on the EU client. v1.10.0 - (11/21/2011) Introduces a few new features in response to RoI and the upcoming Update 5. Note: Update 5 changes will display on Bullroarer, but will not affect normal operation on Live. Morale bar will now have two new sections built into it in order to handle the display of the "bubble" mechanic, as well as the display of dread effects on morale. The Palantir positioning window will now be hidden if you decide to hide your UI while in positioning mode. Last and pretty much least, Palantir will also come with an icon that will show up in said Plugin Manager. 1.09.3 - (12/9/2010) Fixed an encoding issue with French/German translations. Thanks to Vevenalia for testing. 1.09.2 - (12/4/2010) Fixed an issue where the quickslots on the debuff bar would remain clickable after the bar itself was hidden. 1.09.1 - (11/30/2010) Some sloppy coding caused some major framerate issues, this has been fixed. Palantir has an even lower ZOrder, preventing it from appearing above windows without focus. Debuff bar cooldown indicator borders are tied into debuff bar opacity, and the cooldown indicators themselves are tied into debuff bar indicator opacity. Bar structure has been changed again to separate the "fill" from the background, allowing the opacity for both parts to be adjusted independently. This will allow the eventual inclusion of pulsing/flashing effects at specified levels. Added German and French translations of the options panel. Bottom-Outside bar text position has been tweaked. Cooldowns will now default to 0 on first run. Fixes the debuff bar display when hiding the UI (F12) if the player changed the "show Debuff Bar" setting and chose to hide/show the UI before unloading/reloading Palantir. Added a "Recenter Palantir" button to the Main option page. Bar Spacing is now completely separate from positioning. This means two things: 1) the positioning window will always be a set size, often narrower than the width of the bars and 2) the debuff bar will no longer shake side-to-side as you change the bar spacing. When hiding and displaying the UI, Palantir will remember "Show only in combat" and hide debuff bar settings. Palantir will now display when you enter UI Positioning mode (Ctrl+/) if it's set to show only in combat. It will also return to its appropriate settings when exiting that mode. Combinations of Hide UI/Positioning modes will work closer to how it works with other elements. Namely, entering into Positioning mode while the UI is hidden will not display the positioning window until you choose to show the UI. Finally, if a cooldown hasn't been set since v1.08, Palantir will automatically replace nil values with 0, to avoid errors. Changed settings file for cooldowns from Main to qslot, so they will automatically be saved per character, regardless of scope. Users will have to reenter their cooldowns for each character upon updating. 1.07.2 - (9/26/10) Potential cause for issue tracked down to the fact that class.lua was not in the most recent package, this has been fixed. Disabling/Enabling of controls on the color panel of the options window now work properly upon loading. Added support for Bredic's LotRO Mod Manager. Some group/power bar text alignment settings would give the illusion that Palantir wasn't centered. Some power bar text alignment settings gave this illusion by being too far away from the bar - this has been adjusted. Further removed some margin of error involving the quantity changing from splitting up a slotted stack, firing off a cooldown meter. This should now only happen if you reduce the stack size by one. Added a "reset" command that will allow you to toggle Palantir's UI Positioning mode independently of the game - just in case you loaded Palantir while you were in UI Positioning mode. Group Text Position/Display checkboxes will now cause Palantir to move/display the text based off of current values of the appropriate method. Curable quantity display has gotten a lot more reliable in most situations. 1.03 - (9/16/10) Fixes an issue with Palantir ignoring its horizontal positioning setting. 1.02 - (9/15/10) Fixes an issue with the poison curable slot not being clickable after using the skill once. Fixes numbers displaying behind the infinity symbol after using a skill. 1.01 - (9/15/10) Fixes an issue with maximum power not being rounded. 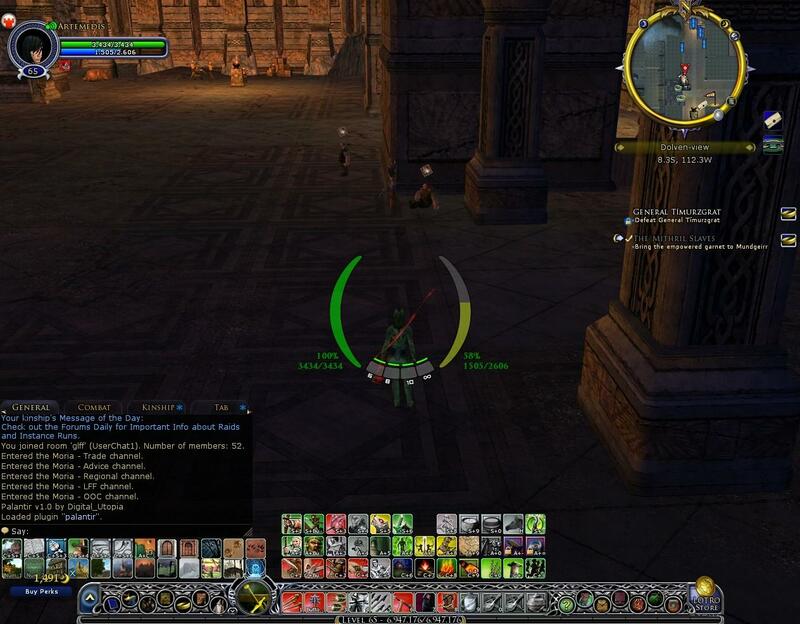 With the newest LOTRO update for June 2013; I just installed Palantir and it seems to be working pretty good. I haven't had any problems with it disappearing, I know that even though I haven't used it before, I thought that others might like to know the newer update does work with it, at least for me. I have Palantir set to disappear when out of combat, but the morale bar will randomly appear out of combat and will not go away. Anybody know how to fix this? I took over Palantir's development. I already added some new features and fixed some annoyances. NB: Palantir v2 branch is installed in a new folder, and uses different file names for saving settings. Many addons hate when user changes Language. It's related to the way decimal numbers are saved "1.5" is not "1,5". Should be OK now. However I will admit I disabled the potion slots and use Buffbars for that function due to its greater flexibility. I improved Palantir's way here, as I can't accustom to BuffBar's way. I load the Palantir over Bootstrap. The known issue apear at this bootmanager too. Later on, Lotro managing of addons has been greatly improved so Bootstrap should no longer be needed. Last edited by Snoopy81 : 07-30-2012 at 02:48 AM. This heads up display is so wonderful. It makes it much easier to concentrate in battle. Don't know how I got along without it. I load the Palantir over Bootstrap. The known issue apear at this bootmanager too. Buffbars have the same Function for Potions and there it work. Why not at your Addon? I have to investigate this further, to find out exactly what the problem is - but from first glance, I can tell that it's nothing user-related. My best guess, just from looking at those particular lines, is that Turbine changed something having to do with item counts, when it relates to potions and whatnot. I'm also going to take a guess, that should someone actually store potions in those slots, that it would also spit out similar errors, and not display the item count. I'll get in game sometime this week to see exactly what changed, and how to fix it. In the meantime, setting the debuff bar to show only indicators should prevent the errors from popping up. ... Online\Plugins\DigitalUtopia\Palantir\DebuffBar.lu a:662: Invalid entity. ... Online\Plugins\DigitalUtopia\Palantir\DebuffBar.lu a:851: Invalid entity. ... Online\Plugins\DigitalUtopia\Palantir\DebuffBar.lu a:1037: Invalid entity. ... Online\Plugins\DigitalUtopia\Palantir\DebuffBar.lu a:1228: Invalid entity. In the matter of quickslot issue: Palantir now loads the quickslots and they're usable, yet the number of potions is shown as 0, regardless of the actual quantity. but just to give an update on "my situation"
thanks for this very very awesome plugin! Ok. It could be possible that the code that determines what language to use is confused by the new client's multi-lingual support. I will look into this as soon as I can. I don't think deleting settings will help, as I believe the check is automatic. I just need to know in order to recreate the issue. Any additional info will help! Any news on quickslot issue? I don't understand LUA part of Bullroarer patch notes, so I don't know if it's gonna be fixed in Monday Update 6. Fixed: The armor values returned by GetArmor are not correct. Added: FreePeopleAttributes.GetBaseAr mor method and BaseArmorChanged event. Fixed: ChampionAttributes.GetStance now works correctly. Fixed: Bad deinitialization of FreePeopleAttributes that lead to a crash on shutdown. Fixed: The plugin manager UI will now set the size of the user options panel when it is changed allowing for the panel to properly layout itself. Removed: ChampionStance.BloodRage since it isn't a stance for champions. Updated: The documentation on Equipment better explains the event firing order for ItemUnequipped. Changed: The time autoload plugins are loaded has been pushed back in the loading process to avoid initialization race conditions. Fixed: Quickslots better support items on load. Added: DragStart to controls that is fired when a drag drop operation starts. NOTE: This is a work in progress still and is subject to change. Added: DragDropInfo now has IsSuccessful/SetSuccessful for getting and setting the success state on the drag drop operation. Fixed: The base Turbine.UI.Window class to properly erase its background. Added: Player now has a GetPet method and PetChanged event. This method works for the LocalPlayer and PartyMember classes and will return the current pet of that player. Added: Wallet support. This is available on the LocalPlayer as GetWallet. The Wallet provides a list of WalletItems and the notifications for them changing. WalletItems have accessors for the Quantity, MaxQuantity, Name, Description, Image, SmallImage, and IsAccountItem. Deprecated: Entity.RegisterForClickHandlin g is deprecated. Use the EntityControl instead. Added: New control, EntityControl. This can be used to create controls that can select entities and/or display a context sensitive menu for the entity. Added: PluginManager.ShowOptions which can be used to display the options for a plugin by its plugin reference. Fixed: Party members leaving a party should not longer cause a crash. Fixed: Party member leave events should fire properly now. Fixed: The GetReadyState function and ReadyStateChanged event function properly now. Fixed: LocalPlayer reports IsVoiceEnabled properly. Added: IsVoiceActive and IsVoiceActiveChanged so plugins can know when users are talking.